In the world of firearms, customization is a hot area. 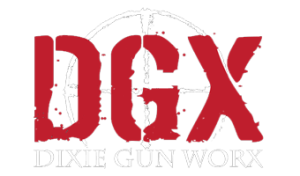 DGX has built custom rifles for hundreds of customers, from hunting rifles, to 3 gun competition rifles, to AR platform/tactical rifles. Now, customers desire an even higher degree of customization. With duracoat, and the more durable cerakote, gun owners get a choice of colors to set themselves apart but are limited in patterns, especially those that are more complex. Enter hydro graphics, a water-based paint transfer process that has thousands of patterns that can easily be added to almost any surface. From the uber popular carbon fiber pattern, to King’s camo, to digital camo, burl wood, Kryptex, muddy girl and even, yes, Hello Kitty, the options that hydro graphics give customers are almost limitless. The process is rather simple. After applying the appropriate base coat color, a piece of film with the desired pattern is cut from a roll that somewhat resembles wrapping paper. It should, after all, since it will feel like Christmas or your birthday after your gun is “hydro dipped”. That piece of film is then placed on the surface of filtered water in a large tank. An activator is sprayed on the film, 60 seconds passes, and the piece being dipped is then gently, at a constant speed, pushed through the film and into the water. The pattern wraps around and bonds with the items. Throwing it in a rinse tank and applying a clear coat follow, and whoolah! 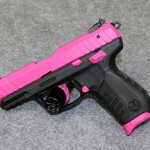 You now have a fantastic looking firearm with a design and look that are all your own. The film, although not as heat resistant as cerakote (barrels should not be dipped), is durable and will last years with proper care. Can you change your pattern later? Sure! What about other items besides firearms? Helmets, handle bars, motorcycle gas tanks, cabinets, smart phone cases, playstation/xbox controllers, plastic/metal card cases, dashboards, pickle ball rackets. We’ve pretty much done everything. One adventurous soul even did their electric can opener (shrug)! 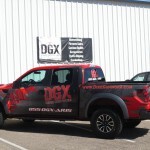 Think you have a project for DGX? Stop by the shop and discuss it with us! Chances are we can give a whole new look to your firearm, motorcycle…or can opener.